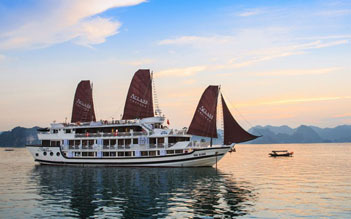 The Syrena Cruise fleet of 2 boats offers a total of 34 luxury cabins & suites accommodating a total of 68 passengers for Halong bay cruises. This trip will give you an enjoyable memory in Halong Bay within 3 day. Highlights of the trip are cruising in the magnificent Halong Bay and admiring the fascinating rock formations in the Bay, joining squid fishing on boat with our crew, discovering caves, ect. 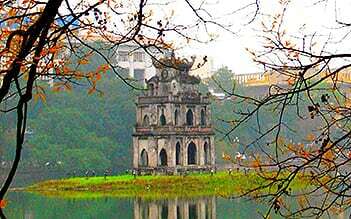 07.30 – 08.30 Pick up at hotels in Hanoi Old Quarters (optional) then transfer to Halong bay. 12:30 Receptionists welcome guests at the International Tuan Chau Harbour. 12:45 Captain welcomes guests to Syrena Cruises by tender. Check in cruise, whilst enjoy a welcome drink, safety briefing and check in cabin. 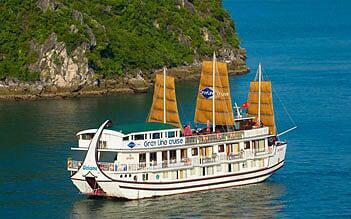 14:30 Cruises stops at Bồ Nâu cave, the core area of the world natural heritage. Transfer by tender to Amazing cave - one of the most beautiful caves in Halong Bay. 16:45 Back to the cruise. Relax and enjoy sunset on the sun deck. Go to the overnight place. 18:00 – 19:00 Enjoy HAPPY HOUR from 18:00 – 19:00 - Buy 1 drink get 1 free (wine excluded). 18:30 Enjoy Vietnamese cooking demonstration. 19:00 Acquaint yourseft with the set menu dinner. 06:00 Morning call (if you request). 06:30 Start the day with Tai Chi - physical movements designed for relaxation, balanceand health - on the sundeck. 07:45 Enjoy breakfast served in the dining room (set menu). 08:30 Transferred to the day boat with separate program. 12:00 Back to the cruise and relax. 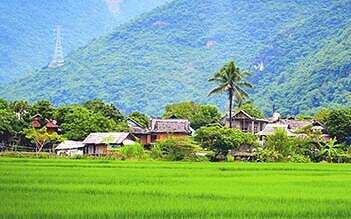 14:30 Visit the Halong pearl farm and Mê Cung cave. 16:30 Back to the Syrena cruise. Go to the overnight place. 18:00 – 19:00 HAPPY HOUR - Buy 1 drink get 1 free (wine excluded). 19:00 Enjoy dinner (set menu). 20:30 Squid fishing on the 1st floor at the entrance of the boat, movie, boards and cards games are available. 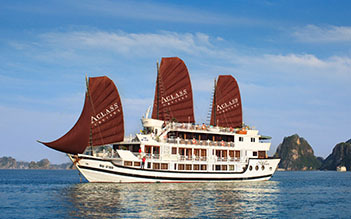 06:30 Enjoy Tai Chi instructions on the sundeck in 30 minutes whilst cruising to Luồn cave. 07:00 Enjoy light breakfast in the restaurant (coffee, tea, fresh milk, water, pastries, bread, egg, fresh fruit, cereals will be served in the dining room). 08:00 After breakfast, take a guided tour to visit Luồn cave - .one of the cave open to the form beautiful about endemic the vegetation of the Halong Bay. Visit Luồn cave by a traditionally woven (bamboo) boat rowed by a local boatman. 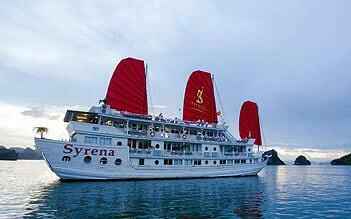 08:30 Then come back to Syrena cruise, relax and check out of cabin. Please put your luggage outside the door. Our porters will collect and get them ready on the Pier for you.Finally, the cruise disembarks in International Tuan Chau harbour. 09:15 Enjoy brunch buffet menu served in the dining room. Settle bills in the dining room after brunch (if you have). 10:45 Transfer by tender back to Tuan Chau harbour and disembarkation. Farewell to guests. 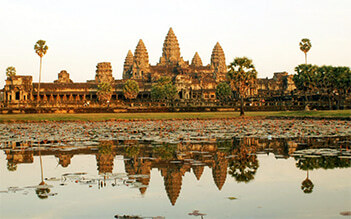 The itinerary can be changed due to the check-in time and the weather conditions. We have all seen the pictures and it does meet expectations. The boat was great our suite just lovely with great ensuite, balcony, floor to ceiling windows to watch the view. The food is great and abundant, the trip on the tender to the caves and the beach for a swim great. Next day the caves by sampan. The highlight sunset with a cold beer or cocktail, squid fishing at night or cooking lesson on the top deck, all wishes catered for. Just go and enjoy! From the moment we were picked up to the moment we were dropped back at our hotel, this experience was really enjoyable. we choose the 3 day, 2 night package and were not disappointed. 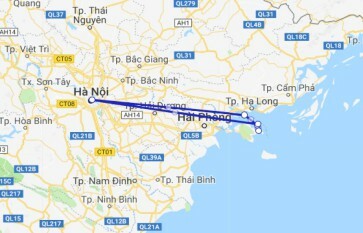 The trip from Hanoi to Halong bay was 3.5 hours but we we travelled in a luxury coach to the boat with wifi - making it so much more easier! The staff here - managed by Mr Thuan - were all exceptional and very professional. The boat was in superb condition - clean and spacious, with our room (Deluxe cabin) also really impressive. The bed was big and comfy, the bathroom was a really good size and our balcony was perfect for a glass of wine whilst taking in the sights of Halong Bay. Each day we had an itinerary of the day's events and these were really enjoyable. From kayaking, cave visits, swimming in the sea, cooking lessons, film night, fishing off the boat - we were not bored at all. All the food was freshly prepared by the on board chef and was very tasty. Each meal was buffet style and more often than not couldn't finish it all as there was way too much! We had two cooking classes whilst on board and they were fantastic as they took place during the Happy Hour so everybody got involved and had a good laugh. Would definitely recommend this to others looking for a professional and enjoyable experience! Halong bay is spectacular and the only way to do it should be with the overnight stay on the boat. I was not particularly looking forward to this trip due to all the negative hype, however the trip blew me away and I was so glad I decided to go. 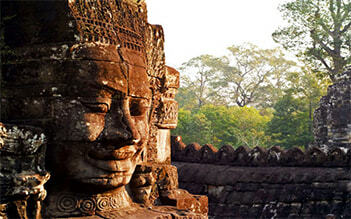 I would absolutely recommend Syrena, the staff were some of the most lovely I have encountered in Vietnam. Food was plentiful. Top floor room with own Balcony was very special. Amazing experience overall. Thank you all at Syrena Cruises. We took the 2 night cruise with Syrena Cruise travelling as 2 couples. All the staff were amazingly happy and very attentive. Prior to boarding, the reservations lady (Rosie) was extremely helpful with all our queries and requests. She responded to all emails within 20 minutes. When we requested quiet cabins towards the front of the boat she accommodated us with no issues. The food was good, although some dishes were a little unusual (Ostrich to name one). If you are not a seafood eater than you should consider that seafood is a big part of the local cuisine. However they were very accommodating for other travellers who advised before hand of their dietary requirements. Happy hour was great value with buy 1 get one free! The tours were good. The second day with the caves was a highlight. The first day cave is very touristy with lights installed all the way through. Whereas the second day was much more authentic. 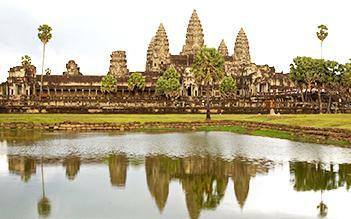 The itinerary is jam packed but as it was only 3 days this was not really an issue for us. One downside was that on our second day, we were the only 4 people doing the 2 nights. As such, there was a bit of a delay waiting for our tender from the day boat back to the cruise. The boat is a little old but all sheets and towels were very clean and the rooms tidy. As to cleanliness there was sometimes the smell of cigarette smoke coming from the staff of the lower level. All in all a great experience and really the only way to see Ha Long Bay.